There is a theory making the rounds that Neanderthals were ousted by Homo-Sapiens (our ancestors) because Neanderthals preferred to sit at home, while our ancestors, being hunter-gatherers, were always on the move. Apparently, the mental stimulation that resulted from being on the move made Homo sapiens smarter and, thus, better able to cope. Your dog may not be in danger of extinction, but animal behaviorists (and most veterinarians) have no doubt that dog mental stimulation is a close cousin of physical exercise in keeping your pet in great shape. Here are some of the proven ways of providing mental exercise to your dog. It is known phenomenon that regular (human) runners cling to a small set of routes. This doesn't work for Fido. Your dog will be much more excited if his routes are unexpected. The park, the forest, down the river, the walking trail — mix it up! 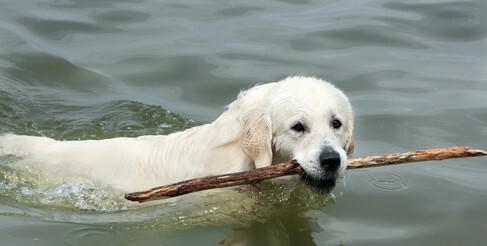 Variety in his physical exercise is another great way to mentally stimulate your dog. A simple method of incorporating this is to involve additional members of the household into his daily walk; since each tends to have different predilections, it mixes things up for your pet. If you are alone, throw in jogging or a bike ride once in a while. 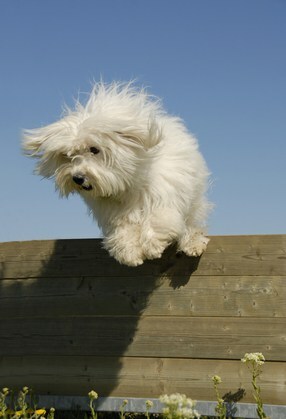 Dog parks — enclosures in which dogs can run free under the supervision of their owners — can be a huge thrill for your dog. The variety of individuals make for a very mentally stimulating environment. You may want to be cautious if going there for the first time; it may be a good idea to keep your dog on a leash initially. The mental exercise of obedience training may be just what the doctor ordered for a number of breeds meant to be working dogs. Highly intelligent dogs — like the Border Collie or the bigger Poodle Mixes — tend to do very well within this structure. Agility training also provides an excellent combination of physical and mental stimulation. This is ideal for dogs that are intelligent, strong and energetic — like the German Shepherd, the German Shorthaired Pointer and the like. Taking along your dog when visiting friends can be a great way of providing him with mental stimulation. Not only is the ride interesting, but friends at the other end — both human and animal — will be sure to boost your dog’s spirits. Obviously, a certain amount of judgement has to be used; not all your friends may welcome your pet. Most dogs love the “find the toy” game. And, it’s a great way to keep him entertained. Some toys, like Kongs, can even provide an edible treat to celebrate his success. We all need to change our “devices” every once in a while; corporations know that, and exploit it mercilessly. Unsurprisingly, your dog can also tire of toys. Set up your electronic calendar to send you a reminder to switch his toys around on a regular basis; he will be happier for it. 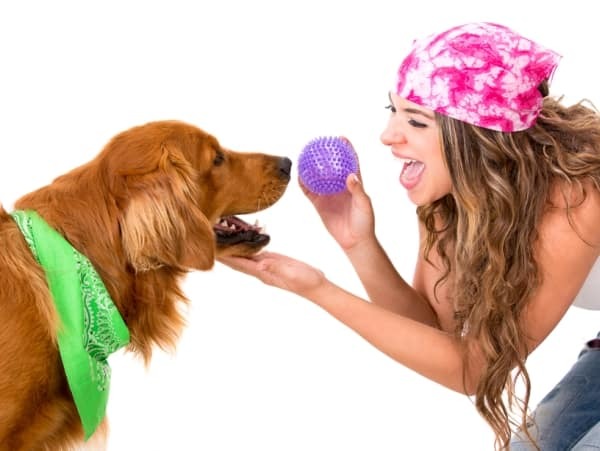 Many dog breeds — the Labrador Retriever and the Golden Retriever to name a couple — will derive great vicarious pleasure from playing a game of fetch. That’s what many of them were bred to do. It’s a guaranteed way of mentally and physically stimulating your dog. The melee of a dog walking group is yet another way of providing physical and mental stimulation to your pet. If you tend to be a busy individual, the mild peer pressure exerted by such groups may be just that extra incentive you need to ensure regularity in your doggie “expeditions”. Studies show that all living organisms are healthier when mentally stimulated — dogs are no exception. Highly intelligent breeds tend to need more mental stimulation than others. Dogs that have less access to the outdoors — if you live in an apartment, for example — will particularly benefit from a structured program of mental stimulation. If you find your dog succumbing regularly to bad habits like chewing, chasing his tail or other obsessive compulsive disorders, one of the best ways to counter those tendencies is to increase his mental stimulation. It does require a concerted effort and a commitment of time, but you may well find that after a while you get used to the new routine enough so that it’s not a turn-off for you at all. Your dog, certainly, will be much happier and better behaved. Next post: Collie Temperament – What Made Lassie So Smart?